Nissa’s String Studio hosts the community-based fiddle group, The Spitfire Fiddle Band. 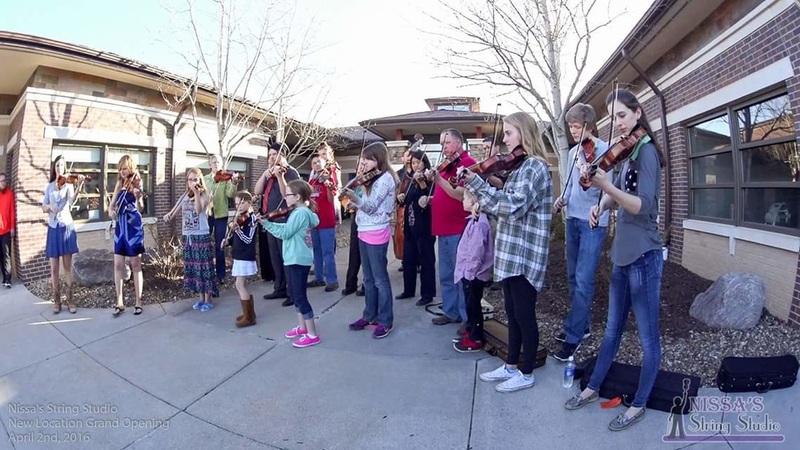 This is a fun group designed to cultivate fiddle music within the community. The Spitfire Fiddle Band plays a repertoire of old-time fiddle tunes in a laid-back, yet productive setting. Learning resources are provided by the studio. Outside-of-rehearsal practice and listening is required! The Spitfire Fiddle Band welcomes all ages and skill levels! Visit the SFB Facebook Page! Fiddling is a great way to develop aural skills, hone creativity and share music with others. This style of music embraces many cultures and has been passed on from generation to generation. Over the past decade, fiddling has become a welcome part of formal and informal music training. It is different from classical music with its own characteristics, sounds and difficulties. SFB meets every other Saturday morning from 12:00pm to 1:00pm at our studio (8535 Executive Woods Drive, #100). Please refer to the SFB Calendar for exact times and dates as they will vary throughout the session. SFB performs on all Nissa’s String Studio recitals, and will make decisions about other performances. Fiddlers may enroll as a Performing Member, or as a Jamming Member. Performing Members will participate in all SFB performances, attend all rehearsals, and will be expected to learn the repertoire of tunes. Jamming Members will try their best to attend all rehearsals and will not be expected to perform. To participate in a performance, the fiddler must know at least 50% of the repertoire at full capacity, and will not play during tunes they are uncertain of. Joining is simple. All you have to do is CLICK HERE to fill out our registration form and process your payment (if paying with cash or check, simply bring your payment to the first session). New AND returning members must fill out the registration form and submit payment. Want to know more about SFB? Contact us for more information.